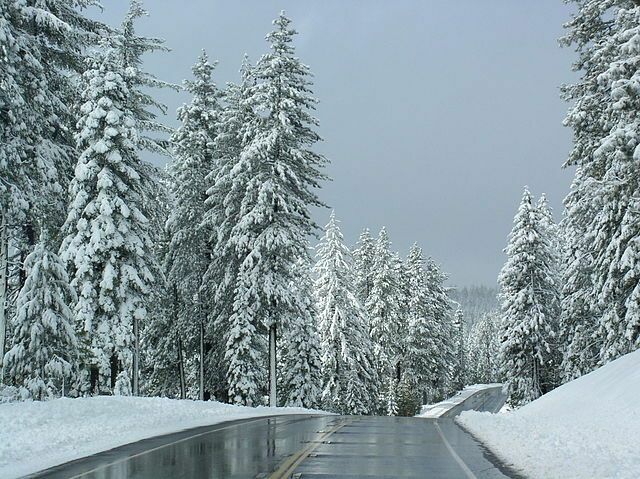 California Highway 89 is probably the most mountainous route in the Golden State, winding 243 miles south from the base of 14,179 foot Mount Shasta through the southern Cascade and northern Sierra Nevada ranges to the high desert of eastern California. And for 47 of those miles, from Truckee to Meyers and skirting Lake Tahoe en route, California 89 lies in close proximity — less than a dozen miles — to nine significant winter sports resorts. And for 47 of those miles, from Truckee to Meyers and skirting Lake Tahoe en route, California 89 lies in close proximity — less than a dozen miles — to nine significant winter sports resorts. Though not as famous some other winter sports corridors — Vermont Route 100 and Interstate 70 in west-central Colorado, for two examples — this section of Highway 89 nevertheless could state its case as California’s skiers’ (and snowboarders’) highway. Situated west of Truckee, Boreal rises above Donner Summit just off Interstate 80. Though modest in size (380 acres) and scope (500 feet of vertical), the resort nonetheless is important in one aspect: It is a great place to learn to ski or snowboard. The majority its 36 runs, which are serviced by six chairlifts, are either green circles or blue squares, and they are generally wide boulevards allowing the most neophyte of riders to get down the hill without much fright. Night riding is also a popular option at Boreal. One of the oldest winter resorts in California — it opened in 1937 — this family-friendly area just west of Donner Pass on old Highway 40 is a throwback to a simpler, more quiet time, starting with its rustic and humble day lodge. With six chairlifts (none of them of the high-speed variety) servicing 500 acres, DSR guests will find 52 trails of mostly beginner and intermediate terrain that have spectacular views of Donner Lake and the surrounding Sierra crest. Just across the road from DSR, lies the original winter playground for the rich and famous denizens of San Francisco. Constructed in 1939, Sugar Bowl was the first California resort to have a chairlift, and Walt Disney had a hand in developing the resort’s Bavarian feel. But the Grand Dame of the Sierra has kept up with the times. It has two base areas from which a system of 12 chairlifts — five of them of the high-speed category — provides access to 1,650 acres over four distinct peaks. With 103 named trails, of which the Silver Belt is the most famed, and 1,500 feet of vertical skiers and boarders of all abilities will find something to suit their fancy. A few miles southeast of Truckee is one of the more popular items in Vail Resorts’ ever-expanding empire. This family-centric, four-season, 3,170-acre resort has plenty going for it, including fabulous tree skiing, perhaps the best grooming in the Lake Tahoe region, four award-winning terrain parks, 100 runs, 2,400 feet of vertical, 14 chairlifts and two gondolas and a Ritz-Carlton hotel. Northstar also provides ice skating, snowshoeing, tubing and cross-country skiing options. The site of the 1960 Winter Olympics, which lies just off 89 south of Truckee, has produced some of the most influential skiers in America, including Olympic gold medalists Tamara McKinney and Julia Mancuso and extreme athletes Scot Schmidt and Shane McConkey. And for good reason: This 3,600-acre resort has some of the most classic and intimidating lines around, including the Palisades, Eagle’s Nest, Tram Face and 75 Chute. For the rest of us, there are 170 named runs and 16 bowls, serviced by 24 chairlifts (seven of them of the express kind), a 120-person tram and a funitel. Also in the package are 2,850 feet of vertical, five terrain parks and limited night skiing. Squaw’s sister resort — they are owned by the same company — is situated in the next valley south, and is essentially a miniature replica of Squaw, but with one important difference: It is the antithesis of Squallywood. Alpine’s lack of glitz — along with1,802 vert, 100 trails and seven bowls spread over 2,400 acres, 11 lifts and great hike-to terrain — is the main reason the resort’s regulars go there to ski rather than been seen. Rising less than a couple hundred yards from the shores of Lake Tahoe, Homey, as the locals lovingly call it, is an unpretentious resort that is short on frills but big on other things, particularly tree skiing. With 1,260 acres and 1,650 feet of vertical, Homewood’s 64 runs has enough to satisfy all types of skiers and boarders. And for the more adventurous there’s the double-diamond Quail Face and/or the resort’s snowcat operation, which makes another 750 acres and 1,840 vertical feet accessible to riders. Also be sure to check out the West Shore Cafe, just across Highway 89 from Homewood’s base lodge; it is one of Tahoe’s more magical properties. A few miles east of Highway 89 at the south end of Tahoe lies the only bi-state resort in the nation: Roughly half of Heavenly’s 4,800 acres is in California, with the remainder in Nevada. The resort is known for its party atmosphere, not unexpected when four large casino-hotels are located not far from Heavenly’s gondola base, but it does have some excellent skiing and snowboarding to be found among its 97 trails, particularly the 1,600-vertical-foot double-diamond plunges of Mott and Killebrew canyons on the Nevada side and the 1,700-foot vertical decent of California’s East Bowl. Heavenly’s lift system of 28 chairs and gondola help you get the most of its 3,500 vertical. Not far from Meyers at Tahoe’s south end, you’ll find this mid-size (2,000 acres) resort off U.S. Highway 50. Though Sierra, which has 46 trails serviced by nine chairlifts, is noted for its long cruiser runs and terrain parks (all six of them), the resort does have a wilder side: Huckleberry Canyon. This 320 acre experts-only playground is accessed by five back-country gates and features cornice and cliff jumps, chutes, tree runs and glades.